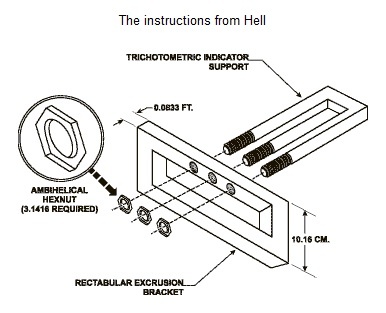 Assembly instructions from hell « Adafruit Industries – Makers, hackers, artists, designers and engineers! Wow… those instructions are almost as bad as the ones from Ikea. Lamentably, this is a good representation of how calculus appears to many people. Did they really mean to create so many optical illusions? The smaller diameter is in FEET while the longer one is in CM. That I can deal with. But I may have an issue getting exactly PI nuts. Hurm… Pecan Pie is a Pie Nut… Nah. It’ll just make the assembly even more sticky. Gee, I wonder if that’s the one I drew in AutoCAD from a hand drawing back in 1989…glad to see this old joke is still around! Surely LadyAda has seen this? WOW, I was a Manufacturing Engineer and used to do assembly drawings similar to this but, this one is actually PAINFUL to look at!! That’s not *exactly* PI nuts, though. *Homer voice* Mmmmmm, pi nuts. This is obviously a new tool in the “war on drugs”: if you repeatedly switch your focus from the bottom left to top right of the “rectabular excrusion bracket”, the effect mimics cheap low-grade hallucinogens – try it, you’ll like it! Just… tell me this is nothing to do with Mars missions, PLEASE!! !